Once celebrated as civic scripture, more widely reprinted than the Declaration of Independence, George Washington’s Farewell Address is now almost forgotten. Its message remains starkly relevant. 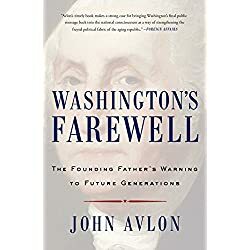 In Washington’s Farewell, John Avlon offers a stunning portrait of our first president and his battle to save America from self-destruction. Washington’s urgent message was adopted by Jefferson after years of opposition and quoted by Lincoln in defense of the Union. Woodrow Wilson invoked it for nation-building; Eisenhower for Cold War; Reagan for religion. Now the Farewell Address may inspire a new generation to re-center our politics and reunite our nation through the lessons rooted in Washington’s experience. Did you know George Washington’s Farewell Address is read aloud every year in the U.S. Senate? Watch the video below to learn more!